This Post has already been read 1568 times. Samsung Galaxy S4 has just been announced. 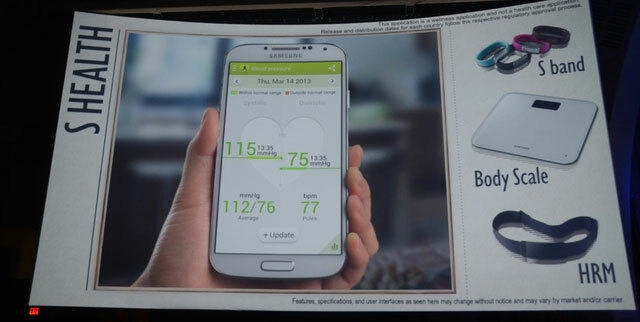 To take the advantage of Galaxy S4 sensor, Samsung has announced the new version of S Health App. S Health app was launched last year by the company. In its latest version, S Health will be taking advantage of the specialized sensors found in the Galaxy S4, namely the built-in pedometer, temperature and humidity sensors. The app shows you the number of steps you’ve taken, features calorie counters (for both the foods you eat and the energy you spend moving around) and measures the ambient temperature and humidity in the environment you are in. There’s also support for blood pressure monitors and glucose meters (if you get those accessories). To show just how health-oriented Samsung is with the Galaxy S4, the company has also launched the S Band. It’s a pedometer bracelet, which counts your steps and syncs with the S Health app. It’s meant to be used for those occasions when you’re running and don’t feel like taking the S4 with you.